Is there an intuitive reason why Hillary Clinton won the popular vote amongst people voting for President, yet the GOP won the popular vote amongst people voting for their Representative in the House? Is the answer 'lots of vote-splitting by people who expected Clinton to win and wanted a GOP House as a check on her power'? 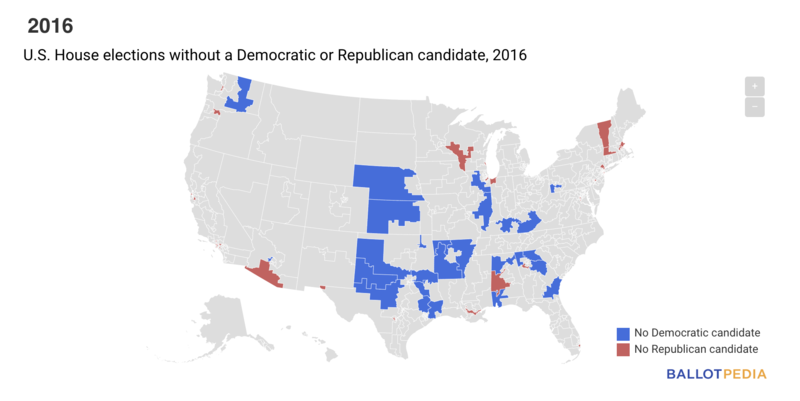 It seems that there were fewer no-Democratic House districts in 2016 than no-GOP House districts. In these districts, Democratic voters would have voted for Hillary but would have been mechanically unable to vote for a Democratic House candidate. Edit #2. Ballotpedia's margin of victory data for all 435 House races (see https://ballotpedia.org/United_States_House_of_Representatives_elections,_2016) lists 12 CRs with GOP unopposed and only 5 Congressional Districts with Dems unopposed. Let's say avg 250k per district, and perhaps 25% of them vote for the Prez candidate from the party that hasn't fielded a Congressional candidate. This leads to a rough estimate of half a million (net) votes to HRC that didn't go to a Dem Congressional candidate. So although the unopposed races story was really elegant, perhaps the bigger story is in fact vote splitting. Edit #3: Ballotpedia list of unopposed districts doesn't count some districts where a candidate ran against another candidate from the same party, or from a third party. However, these omissions are if anything skewed towards Democrat House candidates running up the vote tally (see Brythan's answer), which makes it even less likely that the unopposed races story is a key component of the answer here. The reason that there were fewer ballots cast in the house and the reason there were fewer votes for democratic candidates is that in many US house districts there is only one party on the ballot. Here's a map of the phenomenon. Democrats voted for the president in these districts, but had no House of Representatives candidate to vote for, so the total vote for Hillary Clinton was higher than the sum of the votes for Democratic House of Representative candidates. By the ballotpedia map, there are 30 districts with only Democrat candidates (you have to zoom in) and 26 with only Republican candidates. This doesn't represent a huge disparity in number of unrepresented districts. However, a more detailed look might reveal that the concentration of Trump or Clinton voters in these districts skews things one way or the other. So why weren't there just as many voters who didn't have congressional people of their party to vote for among Trump voters? The answer is that many conservatives and libertarians voted for third party candidates in the presidential election, but still voted for their local GOP house of representative candidate. Anecdotally, I know people who voted for, Gary Johnson, Evan McMullin, and even Hillary Clinton who voted for their local Republican house candidate. This "Never Trump" wing of the Republican party made the Republican votes in the house higher than that of the president, despite many heavily Democrat districts not having a Republican option. Given the nature of secret ballots, this is a hard thing to prove, but there is some evidence. Trump received 46.1% of the popular vote in 2016 compared to Romney's 47.2% in 2012. However, in the house, Republicans got 49.1% of the popular vote in 2016 compared to 47.6% in 2012. With Romney the results were roughly the same, with Trump they widely diverge. This, combined with the fact that the raw number of GOP congressional voters was higher for Republicans and much lower for Democrats, supports the idea that third party voters supporting GOP congressmen caused the disparity in 2016. Since both elections, both the presidential and the house, were elections on specific candidates, it does not surprise me at all. In both elections people vote for an individual candidate, in the case of the presidental election, it is one candidate nation-wide; in the case of the house elections, it is one candidate per district. Since, you do not vote for a party in either election, the comparison is somehow moot, although interesting. In other political systems, the people vote for parties, and the members of parliament are selected based on the party's list of candidates. A possible explanation could be, that the candidates of the Republicans for the House were on average more appealing to the electorate, than the Republican candidate for the presidency. The simple answer is: a lot of voters split the ticket when voting. In 2016, it is safe to say that both of the main presidential candidates had fairly obvious flaws, while the main independent turned out to be a bit of a clod (what is Aleppo), and missed a golden opportunity to gain credibility. So the voters appear to have split the ticket. I don't really like this person, but I like the other one less, so I'll vote for my party's candidate, but vote for the other party for congress to keep them in check. The outcome of the 2016 election indicates that a lot of Democrats didn't like Clinton or Trump, and chose Clinton but voted republican on the congressional race. Keep in mind that Trump's victory was unforeseen. It is likely that most voters expected Clinton to win, but wanted a Republican congress to keep her from getting out of hand. Also remember that Hillary Clinton did not win a majority of the popular vote, only the largest minority (what is called a plurality). A majority voted against her (and against every other candidate). So no vote splitting needed. Looking at the numbers you cite, Republicans have roughly equal numbers of votes for president and the House. Democrats lost four million somewhere. This sounds more like Democrats weren't voting for the House but only president rather than vote splitting. Your Ballotpedia list seems to be missing a number of no-Republican elections at first glance. E.g. CA 12. Democrat and independent. No R.
CA 17. Two D. No R.
CA 29. Two D. No R.
CA 32. Two D. No R.
CA 34. Two D. No R.
CA 37. Two D. No R.
CA 40. D and independent. No R.
CA 44. Two D. No R.
CA 46. Two D. No R.
That's more just from California than the list for the entire country. If we add those nine to the five from the rest of the country, that's actually more than the twelve Republican-only districts. And remember that in seven of those districts, both candidates were nominally Democrats, so both candidates count towards the Democratic vote total. Also 8, 9, and 16 in New York had no Republican (in addition to 17, where the Democrat ran unopposed). So seventeen Democrat-only versus twelve Republican-only. Split-ticket voting is driven by voter frustration, as is low voter turnout. Statistics suggest that such frustration is more prevalent in congressional races than in presidential races, for example voter turnout for the 2016 was roughly 59.3%, but the mid-terms of 2014 saw only 35.9% turnout. Both are quite low among developed countries and the 2014 mid-term turnout was the lowest in recent history. A longer answer that focus on the why could be that increasingly complex voter behavior exposes flaws in simpler voter models. Political theories, such as the median voter theorem (which suggests candidates will move to the middle), are failing because attempt to model voter behavior as one-dimensional political spectrum or single-peaked distribution are substantially oversimplified. In other words, labels like left vs right or conservative vs liberal have only limited applicability. As a example, individual can be both fiscally conservative and socially liberal. An example of this in US history might be the Regan Democrats who were more moderate/libertarian than liberal. So we've developed voters who do NOT vote a straight party ticket, perhaps even on principal; frustrated voters may not want to throw their support behind unified government. Studies have shown that those who vote a strait ticket are typically highly partisan (and thus predictable by simplified models), but that straight-party voting is on the decline. At the same time, it seems that many candidates have gotten substantially more partisan, leading to frustration. In a two-party system (simplification to the major parties) is breaking down as voters get more information and less partisan while candidates head in an orthogonal direction. For the reasons above, the median voter may not have his interests well matched by either of just two candidates, and a realistic political map fills with gray, or at least lighter shades of the color representing political parties. Both parties do it but over 1,000 state legislative seats and many governorships were lost from the Democrats for too many reasons to list here, under Obama's 8 years in office. Not the answer you're looking for? Browse other questions tagged united-states election presidential-election house-of-representatives or ask your own question.